Mummy Of 3 Diaries: Do you ever feel like you can't keep up? Do you ever feel like you're NOT a Super Mum? The answer is YES! Lately I've been feeling like a ship sinking in the middle of an enormous ocean of things I need to do. The list grows bigger and BIGGER as I grow tired and sleepier. My girls love being active so who I am to stop them but their list of out of school activities is growing all the time. The girls both have an after school club which they attend once a week as well as weekly Rainbows / Girl Guides and weekly private swimming lessons. Daddy has joined a gym and now goes three times a week for an hour at a time. And what has mummy done......nothing! I spend my whole life making sure that I am in the right place at the right time to drop kids off or pick them up or get things ready or sort things out. I want to be a good mum but I also want a life. I want to do things that I enjoy, although I now feel really selfish for saying that out loud. Do you think I'm being selfish? I know I get a few hours to myself when the girls are in school and little man is in nursery but it's just not long enough to go anywhere or really do much. I try to treat myself to a bath or a nice lunch to cheer myself up but that's about all I can do, isn't it. I love my little family and I always do everything I can to make sure they all happy. I just sometimes forget to make myself happy too which often ends up in a grumpy, fed up mummy who just wants to run away from it all and hide where no one can find me. I'd never actually do that but it's not a nice feeling to even want to do it. 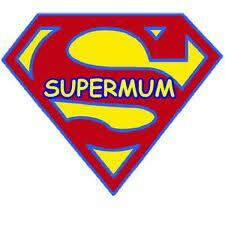 I'm NOT a Super Mum and I know I'm not but I try my best which is all that I can do. Maybe one day life will throw me a life raft and the ride will get easier.